The Place For The Shorkie Truth! So your dreams are becoming a reality!! You have decided you want a Shorkie puppy. You think you know just what you want in a shorkie puppy right???. But do you? Please consider before you adopt if you have chosen a truly good Shorkie breeder. You deserve nothing less than a happy, healthy, wonderful Shorkie puppy! You'll be living with your new fur baby for many years to come so it is of the utmost importance you choose carefully! #1 Things to look for in a shorkie breeder! HONESTY! The Shorkie Club Of America Does Not Support The Hybrid Vigor Theory That Says Purebred Dogs Are Not As healthy As Mix Breeds! That is just offensive to the years and years of purebred breeders that have spent years and years perfecting a breed by genetic testing and impeccable breeding practices! A well bred puppy is exactly that! A well bred puppy that comes from genetically tested sound parents. A "Health Certificate" from a veterinarian is NOT Health testing. It is only a piece of paper the vet signs after taking the pup's temperature and looking for obvious signs of disease stating he examined the dog and it appears to be free of disease at the time of examination. These health certificates are required by air lines before they will allow your pet on the plane, but some breeders try and represent this paper as proof your dog was health tested by a veterinarian. This certificate has nothing to do with health testing to find a congenital condition that may show up months after you have your Shorkie puppy. Quality Shorkie breeders Will give the intended puppy parents a full review of the Shorkie breed, including drawbacks of the perspective breed first, such as potential health problems and will never ever tell you that there re no health problems in the breed. Will give historical information of how the breed was originally developed (Stefanie White started the breed here in the USA) and especially indicating the breed temperamental "quirks" and if that temperament is suitable for the prospective family and their lifestyle. Responsible breeders do this so the puppy does not end up abandoned in a shelter because the buyer did not understand breed specific behavior and got the puppy because it was "cute" not knowing what its character would be like when grown. Shorkie puppies are indeed excellent pets. But they may not be suitable for every family. Many potential puppy parents just fall in love with the furry faces and don't realize what health risks shorkies are at risk for. Make sure your Shorkie breeder is open and honest about the Shorkie breed and does not hide this from you!!! Any Shorkie breeder claiming that the breed is not at risk for health issues is not being truthful. They should know exaclty what health risk shorkie puppies have. Mix breed dogs are NOT healthier!! Regular vets for the most part are not experts in the field of breeding or reproduction. Due to this they may not feel they have the right to tell a client not to breed or may feel that they will lose business by doing so. Sadly enough even if a vet did tell a breeder not to breed the breeder may not listen and only give into the parts of the conversation the breeder wanted to hear. No matter how good a vet is it is impossible for one to tell that a dog being considered for breeding is clear of genetic disease by just doing a routine examination. Genetic testing that has been developed to weed out these issues call for the qualifications of a specialty veterinarians that are qualified to do the testing not just a regular vet. The American Kennel Club is only a registry. AKC registration does not guarantee you a quality and they cleary state it on their site sire. The AKC is the oldest purebred dog registry in the US but it is for lineage only. Just because the adults they breed to produce Shorkie puppies are AKC registered does not mean they are breeding quality. All of my personal dogs are Triple registered. AKC CKC and APR but that has nothing to do with Shorkie Breeding and producing healthy Shorkie puppies. Love and are committed to every a Shorkie puppy they bring into this world. Their Shorkie puppies are apart of the family and welcome the new puppy parents in as extended family members when they place their fur baby in their home. Take every step possible to ensure to make the Shorkie puppies they produce have a home to go to and will never end up in a bad situation, shelter or rescue. Always honest and upfront about the Shorkie puppies you are placing. and take the time to explain everything to you about owning a new Shorkie puppy . They will talk openly about genetic issues and concerns you may have. Always make sure that the entire family is in agreement on adopting a new Shorkie puppy and never ever try and push and adoption through. 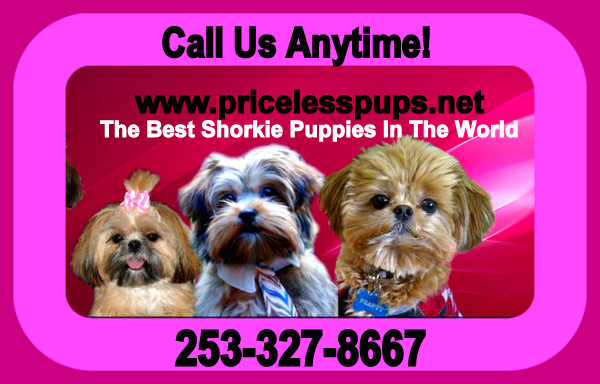 If they are looking for a deal or discount refer them to the website as there are many cheap Shorkie puppies for be found for sale. Explain to them how much a cheap puppy may cost them in the end. Speak to everyone that is involved in adopting the Shorkie puppy. No Shorkie puppies are ever to be given as a gift. Matching the right puppy with the right person is a huge task and the person who will be taking care of the dog has ever right to take part in the selection process . No gifting Shorkie puppies ever!!! Is always available to take a Shorkie puppy or a dog back that they produced. Make sure that Shorkie puppies they produce are happy and healthy but of sound temperament as well. A responsible Shorkie breeder will make time to be home full time the week the mamma is due, so not to miss a single puppy being born. Will never ever be in a rush to send their babies home right at 8 weeks and never before that, Most responsible breeders keep their puppies until they are a minimum of 10 weeks old to ensure proper socialization. Shorkie puppy ever leaves until it is confident and ready for the world.